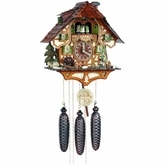 This German Black Forest cuckoo clock cottage displays a hunter searching for animals. 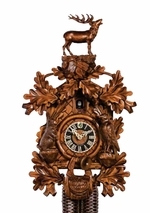 At the top of every hour the hunter raises his binoculars, the waterwheel turns, the dancers revolve, and the clock plays one of two different twenty-eight note melodies, Edelweiss and the Happy Wanderer. Three cast iron pine cone weights are suspended beneath the clock case by three separate brass chains. The hand-made pendulum continously swings back and forth which controls the timing of the clock. On every hour the cuckoo bird emerges from a swinging door above the clock dial and counts the hour by cuckooing once per hour. (Example: At one o'clock the bird will cuckoo once. At eight o'clock the bird will cuckoo eight times) The half hour is announced with one cuckoo call. There is a sound shut-off device beneath the base of the cuckoo clock. Pushing the lever up disables the cuckoo birds cuckoo, the moving hunter, waterwheel, and the music. Pulling the lever down enables the hunter, the waterwheel to move and allows the music and cuckoo. The eight day Regula movement is wound once per eight days by raising the three pine cone weights. One weight powers the time, one weight powers the Swiss music box, and the other weight powers the cuckoo bird and cuckoo call, the band, and waterwheel.